This module provides a Python API to IMMA files. IMMA files are not necessarily consistent in their contents - each line can have a different set of extensions. So we can’t treat the file as a table of data - instead we treat it as a list of records, and read those records one at a time. Then every time you call iobs.next() you will get the next record from some_file.imma. 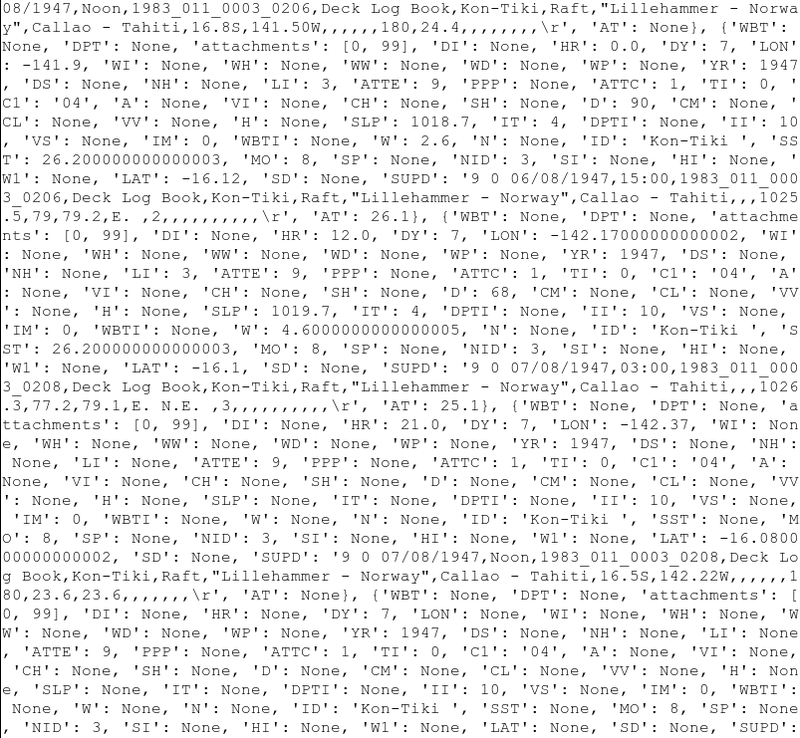 Each record is returned as a dict where vthe keys are the IMMA variable names. So after rec=iobs.next(), the sea-surface temperature is in rec['SST']. SST is in the core extension, so rec['SST'] will either have a valid number, or be None (blank in the IMMA record). If you look for a variable in an extension other than core it may be that the extension is not present in the selected record. In this case looking for it will raise a KeyError. I.e. rec['DCK'] might be a valid deck ID, it might be None (if the ICOADS extension is present but the DCK entry is blank) or it might raise a KeyError (if the ICOADS extension is missing from that record). The list of extensions to write to the file is controlled by ob['extensions'] - an integer array containing the extension_id for all the extensions in the record. You need to update this explicitly - if you add or delete extensions from a record, update this array. Turn an imma file into an iterator providing its records. filename (str) – Name of file containing IMMA records. iterator - call next() on this to get the next record. Load all the records from an imma file. Just the same as list(IMMA.get(filename). Write the given record to a file. File should be result of open() (or anything with a write method). record (dict) – One IMMA record. fh (file) – File to write to (from open() function).